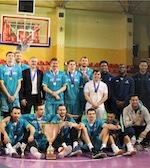 Urartu Vivaro have won the EAEU Basketball Cup with 4 participating teams. In the decisive game they edged Arsenal from Tula 92-72. Shane Henry (203-F, college: Virginia Tech) top-scored for the winners with 22 points and 14 rebounds, while Tade Keshishyan (185-G, college: Bristol) had 15. Monty Boykins (196-SG-95, college: Pittsburgh) poured in 12 and JaCori Payne (178-PG-96, college: Columbus St.) brought 11. Dmitriy Ritenko and Artem Popov (205-PF-93) answered with 16 points apiece in a loss and Ilya Sinkevich (194-G-91) nailed 14. 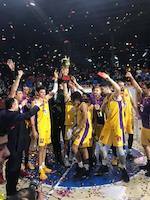 Urartu Vivaro, Barsy and Arsenal finished with 2-1 records, while the Armenian team celebrated the trophy by point difference.